This week I bring you my third installment in The Local Mash series, focusing on Finnegans, a unique, innovative and inspiring, local, non-profit beer company. In this post I will cover some of the history and development of the organization, discuss Finnegans’ mission, provide you with some insider perspectives courtesy of my interview with Hillary Lewis, and let you know how their Irish Amber tastes. Let’s just dive right in! For anyone who is unfamiliar with Finnegans, I’ll take a moment to give you an idea of how unique this organization is. 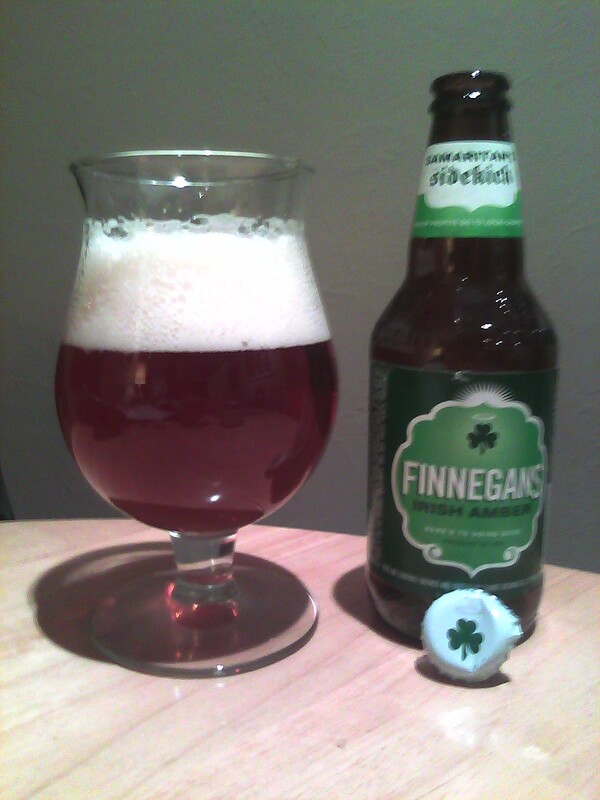 To my knowledge (this is a topic I have researched several times over the last year, and it helps that my girlfriend was a FINNtern who really knows her beer) Finnegans is the only beer producing company that donates 100% of it’s profits to charity. Yep, you read that right, an entirely non-profit beer company. Now why don’t I call Finnegans a brewery? This is where another unique facet comes into play; the beer is brewed and bottled at the Summit Brewery. Though the bottles say Summit and the beer is brewed using their facilities, the companies are distinct, and Finnegans is not owned by Summit. So with that in mind, let’s cover a bit of history of how Finnegans came to be. The roots of what would come to be Finnegans arose from Jacquie Berglund’s work with Cara Pubs, the highly successful local franchise of Irish themed pubs owned, up until recently, by well known businessman Kieran Folliard. Kieran has since decided to fully pursue his other venture, 2 Gingers Whiskey. During her work with Cara Pubs, Jacquie, in response to many requests for financial donations, combined with her generous personality was doling out an increasing amount of charitable donations. While this was embraced, it was quickly outgrowing the budget that Cara Pubs had in mind for their donations and Jacquie was becoming more focused on philanthropic work (her recent blog post gives you a good idea of her commitment to social entrepreneurship). This passion intersected with a fairly longstanding rumbling that Kieran should have his own beer brand and the initial test run for a charitable beer was incarnated as “Kieran’s Irish Potato Ale” which was contract brewed with the now defunct James Page brewery in Northeast Minneapolis. In 2000, after seeing the potential for a successful business plan, Jacquie went off on her own and created Finnegans, which would be brewed with James Page until 2003 before moving to Summit. It took 3 years for the company to become profitable, donating what they could to area charities, and establishing the Finnegans Community Fund which is the arm of the company which distributes the donations. The most recent figures I could find for the total donations made by Finnegans to area charities was from October 2010 showing over $162,000 to more than 60 charities in the areas that Finnegans is sold. Finnegans currently distributes to Minnesota, Wisconsin, North Dakota and most recently South Dakota. Although Finnegans has donated money to a wide variety of charities in the past 11 years, this year’s focus has been on donating to food shelves in the states of distribution. Locally, this partnership has been with the Emergency Food Shelf Network (EFN), a 35-year-old organization working to end hunger in the Twin Cities area (they are always looking for volunteers, and it is a great opportunity to get a group of friends together to create positive change in your community). Finnegans’ donations are aimed at expanding EFN’s “Harvest For The Hungry” initiative which purchases food for meals from area farmers. Lots of breweries are focused on environmental responsibility and developing community stewardship, but I must say that Finnegans is truly in a league of their own. The type of positive change they are making by selling their beer is absolutely second to none, and given that they are financially sustainable at this point, shows that this is a replicable business model which I hope to see other beer organizations adapting. Many people have become aware of Finnegans particularly in the last year and a half thanks in a big part to the snappy marketing revamp they received from the Martin|Williams advertising agency. The makeover included new packaging (an aesthetically pleasing, clean, white and green motif) and a host of witty quips, playing on Finnegans’ Irish heritage, to grace the bottle necks, buttons and other promotional materials. Some examples include: ’12oz Hail Mary’, ‘One Credit In Heaven’, ‘Guilt Eraser’, and ‘I’m a Goody Two Pints’. The advertising has worked wonders, enhancing the already thriving organization and playing a role in the 31% sales increase in 2010 (their best year yet). Some Irish eyes are surely smiling. Hillary Lewis (HL): “Drink Like You Care” started in 2007 to create a targeted giving campaign in which our distributor matches our profits, doubling our giving. The time frame for the campaign is always from November 1st-December 31st. In Minnesota, that means for each keg of Finnegans sold, the equivalent of 50 meals are donated to EFN and each case (24 bottles) sold equals 8 meals donated. BB: I have heard that in addition to the Irish Amber, Finnegans will be adding a new beer to the lineup. What can you tell me about it? HL: Our newest beer is a Blonde Ale which will be available as an early preview release from the end of February through March, and then available as a general release in the form of a summer seasonal from April-August. BB: Do you have any other new beers up your sleeve? HL: Nothing I can tell you about at this point. BB: Outside of your connection to Summit, what is your perspective on other local craft beers? BB: What is your favorite part of your job? HL: That’s tough, there are a lot of things I enjoy. I really love the mission of the organization and how unique we are. I get to meet a lot of great people and attend fun events. It fits my personality well to be out working with people face-to-face. BB: Last one, what beers have you been drinking lately? HL: Well besides Finnegans, I have gotten into some sour beers lately, especially from the Lips of Faith Series from New Belgium; I liked both Le Terroir and La Folie. It’s also the time for fresh hop beers so I’ve been enjoying those. My boyfriend is a home brewer so I’m always drinking his home brew too. I want to say a BIG thank you to Hillary for taking the time to sit and chat with me. A bunch of the details from Finnegans history came out of our conversation as well. Finnegans is also unique in that they utilize community members as volunteers for various events and promotions, so if you are interested in helping to support Finnegans, becoming a member of “Team Finnegans”, or even a FINNtern you can find more information here. Also, to find out where you can get out to “Drink Like You Care” you can use this link to find out where Finnegans is sold near you. Appearance: Crystal clear, bright copper color with a frothy white head that laces nicely down the glass. Aroma: Pleasantly sweet up front with some red licorice, toast, caramel. There is a mineral aroma that comes in towards the end and gives way to a light earthy hoppiness. Aromas are well balanced. Flavor: Tastes like a toasted biscuit with marmalade spread initially before lingering on some caramel and finishing with an enjoyably subtle citric bitterness. Mouthfeel: Fairly dense carbonation that provides a light tickling effervescence on the tongue, light on the palate with just enough bitterness on the end to keep the sweetness from lingering. Overall: This is a well balanced, very sessionable (meaning you can have a couple or more in a sitting) and tasty. The light biscuit blends well with the fruity/caramel aromas and flavors. The hops are just barely present, leaving the malt to take center stage. I enjoy this beer on many different occasions, and it is very versatile for pairing with food; it works well to take down most any sandwich, is subtle enough for a light salad and can stand up to roast meats. Finnegans was smart to choose such an adaptable and palatable beer (a great crossover beer for people that drink pale lagers) for their only offering (at the moment). Looking forward to the Blonde! Well this has been an exciting post, and definitely one in line with my passions (and palate). Thanks again to Hillary and please contact me if you would like more information about Finnegans. Next week’s topic is still a mystery to me, but I’m excited to see where my mind will wander. See you then. Posted in Reviews, The Local Mash and tagged beer review, craft beer, Drink Like You Care, Emergency Food Shelf Network, Finnegans, non profit. Bookmark the permalink. Well done! Interesting interview with Finnegan’s…admirable business model.